Artificial Christmas trees: there are many reasons to choose one this festive season: you can use it year after year; it won't leave needles or resin all over your carpet; it'll be hypoallergenic and come in a wide range of styles. 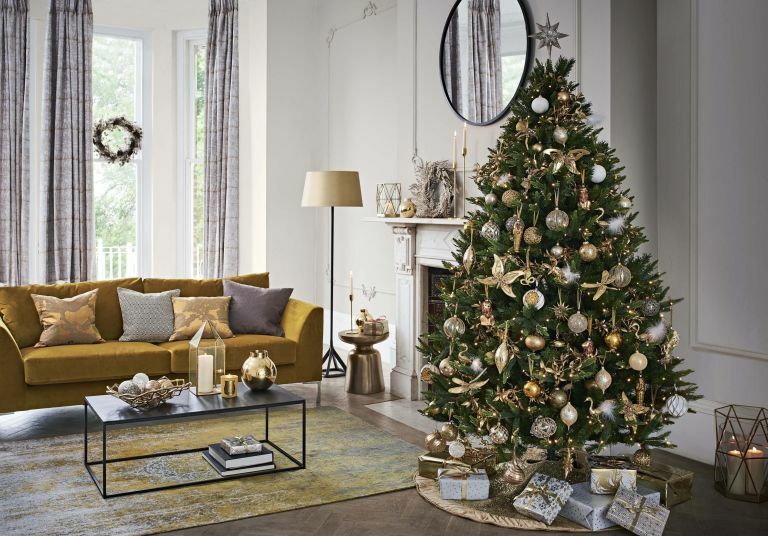 In fact, if the traditional look of a realistic tree is not for you, you can get an artificial version in pretty much any colour, be it neon pink or glitter covered – there really is something for everyone. However, with such variety on the market and it can be baffling to know where to start. So, follow our advice on picking the best, including what you can expect to pay, how to choose the right size and some tips on how to care for it. Then, mosey on over to our pick of the best artificial Christmas trees to snag yours. You probably already know where your Christmas tree will go (same room as every year, right? ), but is it the best place? Your Christmas tree is supposed to be the centrepiece of the room where you all gather on Christmas Day, but does that mean it's too close to a fire, blocking an entrance or overwhelming the space? If you ticked 'yes' to one of these questions, it might be worth a rethink. Once you have settled on a location and before you pick out (or haul the tree from the loft), measure the height, width and depth of the space. Your tree should be at least half a foot shorter than the ceiling to allow clearance for the topper – no one likes a squashed fairy. Allow, too, for space around the tree so that it is not pushed up against the walls or furniture. Slim trees are ideal for narrow spaces, but don't go for anything too spindly, especially if you want an authentic look. How much does an artificial Christmas tree cost? As with any purchase, buy the best you can afford. A good artificial tree can be expected to last for at least 15 years so it is worth the expense when you work out how the cost is spread. Expect to pay from around £250 for a high-quality 6ft, unlit tree. Larger trees and the best imitations could cost in excess of £700. This may sound like a large outlay, but a real 6ft tree will cost at least £50 so just think of it as 14 years' worth of real trees (then treat it well and it might last 20). How to spot a good quality artificial Christmas tree? When you shop for an artificial tree in person, you can easily judge the look and strength of the product in front of you, but this isn't possible when buying online. Fortunately, top-quality brands like Balsam Hill will allow you to order samples from their website. This helps you check the actual texture against what you think you see in the picture. If you can't order a sample, always look at a close-up photo and check reviews where available. Best branches: which type and material? The very best trees have bristles that are barely distinguishable from real branches. These tend to be made from a material called PE plastic (or polyethylene). The PE can be injection-moulded into needles to mimic the feel and colouration of real foliage. Cheaper trees are often made from PVC strips. These look more like dark green tinsel to mimic fir-type trees. Once dressed they still make a beautiful centrepiece and offer a pleasing 'full' look. Mid-range trees tend to be a mixture of PE needles with PVC fir to add density. Hinged branches are better than hook-on as they can quickly be assembled by merely pulling the branches down into place. Don't just check the branches. A good tree should have a well disguised trunk (or centre pole). You also want a sturdy stand so go for metal instead of plastic. If you can, find a tree with a guarantee – there is nothing worse than taking your tree out for its second year and finding yourself assembling a sparse twig. Traditional artificial trees are designed to mimic real trees so will often be named after their authentic counterparts. If you know you prefer your Nordmann fir over your Fraser fir, then that is the basis for your search. To simplify things though, many manufacturers allow you to search by height, shape or 'realism'. For very traditional schemes, you will most likely want the best real-look tree you can afford. These can also come 'frosted' to appear as though they have just been taken in from a light snow shower. In contemporary schemes you might be tempted to try something a bit different and this is where the many vibrantly coloured trees come to shine. Black, brilliant white and even neon trees have been popular in previous years. These are perfect for making a statement. What about a pre-lit tree? Pre-lit trees are really easy to dress, removing what can be the dark art of fairy light placement. They are often built to have inconspicuous wiring which is another benefit. Some may be concerned that should the lights fail, you have a tree you can't use. Look for a good manufacturer that uses energy-efficient LED lights with a 50,000-hour life. Some will also offer a guarantee on the bulbs and replace them should they blow. If you want more flexibility, go for an unlit tree so you can add the lights in the formation (and colour) of your choice. In short, if you want the freedom of creativity go unlit, if you want speed choose pre-lit. Check out our guide to Christmas light safety and find a pick of the best fairy lights. Clear plenty of space to work in and protect the floor if your Christmas tree stand does not have rubber foot protectors. A larger tree will often require two people to lift and position the sections of the tree, so grab someone to help you. 1. Set up the stand: work out where it needs to be positioned to give the branches room. Most stands unfold with a bolt to secure it in position. 2. Insert the tree: some trees come as one part, others are in two or three sections. Position and ask your helper to secure it in place. Stand back to check it is level and doesn't wobble. 3. Position the branches: unfold the branches and and reshape any bent foliage. If your tree has a separate section for the top you might find it easier to open this out before placing on the tree as it can be hard to reach when the tree is fully opened. 4: Add fairy lights: if your tree is pre-lit, now is the time to connect the lights and check they work. Or, for an unlit tree, add your own string of Christmas tree lights. As a rule of thumb, use 100 lights per foot and a half of tree, so you will need a 400 light sting for a 6ft tree. Of course wire length is crucial. We like to have enough to wrap the lights up the tree (close to the trunk) then weave back down the outer branches. More is definitely more when it comes to lights. 5: Add a skirt: before you hang baubles and decorations in the lower branches, it is time to add a skirt to cover the base if you are using one. 6: Add decorations: decorating a tree is a very personal thing. What you use and where you place it is up to you. Top tips though are to keep weightier ornaments near the base for balance, and spread similar ornaments out to create a good pattern. Watch our guide to decorating a Christmas tree (coming soon). 7: Stand back and inspect: step back and give your tree a good look up and down. Move anything around that doesn't work, then move it again. Check there is nothing edible/fun to play with in reach of the dog or cat. Keep your tree away from heat sources. When the festive season is over, remove all ornaments, unplug the tree and dust the branches if required. If you do need to vacuum your tree, be sure to use the soft-brush attachment to prevent damage. Carefully fold the branches and deconstruct your tree. Store it in the original box or bag and keep it somewhere cool and dry. To avoid it getting damp or smelling musty, you can keep it with a container of baking soda, coffee grounds (not used) or silica gel sachets.